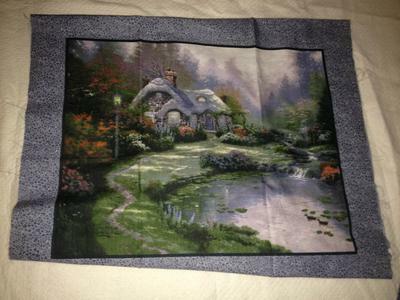 I'm wanting to make a Thomas Kinkade quilt. I have found a panel with two pictures. I plan on cutting them out and adding other blocks to it. Anyway, the only thing I'm stuck on is how to quilt the picture to keep it from bubbling up later. I don't want the threads to show and ruin the picture. I've seen things on invisible thread. Can this be used? Or is there another method I'm not aware of yet? If this were my piece and I didn't want my thread to show, I would use invisible or monofilament thread. It can absolutely be used for your quilt. There are a couple of things to be aware of when using this type of quilting thread. Smoke or clear. Monofilament comes in two 'colors' or rather tints. The darker one, Smoke, is used on dark or shaded colors. 'Clear' is used on light fabrics or clear colors. The only way to know which one works best is to test them. In looking at the panel, I suspect you will use both 'colors' for your quilt. This type of thread does have a bit of a sheen on it. Try to minimize traveling over the same line more than once so that you don't 'build up' the threads and the amount of 'sheen' in one place. My favorite brand is YLI's Wonder Invisible Thread. It is a 100% nylon thread. Don't iron after quilting as nylon has a lower melting point than polyester. Use a smaller needle, like a Schmetz Microtex Sharp 70/10 needle . The needle eye is appropriate for this fine thread and the shaft creates a much smaller hole in the quilt sandwich. Unlike its cotton counterpart, monofilament won't fill up the holes after it relaxes in the stitch. When I use monofilament, I use a 50 wt 100% cotton in the bottom. 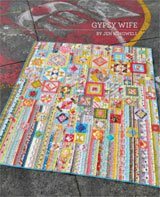 Either Aurifil or Superior Threads' Masterpiece are a good choice. You'll also need to adjust your sewing machine tension lower, both because you're using a different thread in the needle and bobbin, and because this type has stretch to it and creates its own tension as it winds its way through your sewing machine. For more information on using monofilament click here to go to "Quilting with Clear Thread: Tame the Invisible Thread Beast". ...check the quilting distance for the batting that you choose to use in this project. The packaging should list the maximum distance recommended between the quilting stitches. 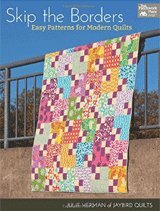 I hope this has helped with your quilting decision for your Kinkade quilt. I'd love to see it when you're finished! Please consider sharing it on our Share Your Quilts page. Readers, your comments are most welcome! Please share using the link below. When I have a preprinted picture, what is the best way to raise certain areas for depth? There are two ways that instantly come to mind. 1. Don't quilt (or quilt very little of) the areas you want to come forward and heavily quilt right next to those areas. The difference in the amount of quilting will provide contrast. Use a batting with some loft (100% wool is my favorite) to accentuate the difference in quantity of stitching. 2. Use the technique called 'trapunto' and added an extra layer of batting behind ONLY those layers you want to have come forward. I LOVE your website!! 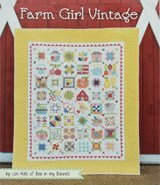 I came back today to find suggestions for machine panel quilting. I have 4 beautiful panels on this queen sized flannel quilt I have stitched around. But they are large and need quilting inside the picture. I am already using silk-wrapped cotton threads front and back. Do you suggest I switch to the clear thread for the picture, or do you think it will be alright if I use my gold-tan and navy interchangeably? It is a nature picture with ducks swimming in the water and dear on the banks with fir trees and a big sun in the clear sky. I also have cotton off-white I can use on top in the sky. But I was wondering how well it works stitching outlines of what's in the picture, and if it's necessary to outline everything or which things to outline. Do you have suggestions for that question on your website somewhere? Thanks for all the help! It is especially helpful to an occasional quilter who never quite perfected the art.... yet! From the Editor: Hi Patty! How much quilting is needed within the panels is dictated, in part, by what type of batting you used. 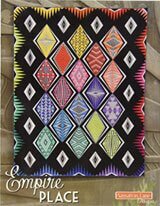 Check the package or manufacturer's website to confirm how far apart you can quilt. Now without having seen the actual panels, I giving you generalizations that hopefully you can apply as you analyze the piece yourself. If the colored threads are a good match to the quilt...that means in color and/or in value...and you're happy with how they look, then by all means USE THEM. That's part of the fun of quilting. You are the artist! Trust your eyes. If you've been quilting for a long session and then you stand back and your brain looks at it and goes 'UGH! '—DON'T LISTEN! Go to bed. Get a good night's sleep. Take another look in the morning. I can't tell you how many times I've worked into the wee hours of the morning on something, thought I'd wrecked it, and then in the morning couldn't even find what was bothering me so much the night before. If you don't like the colored threads, then switch to the monofilament. As far as the outlining goes, look at what makes sense to draw attention to. Remember that where you put a lot of quilting will make that part of the design recede visually. 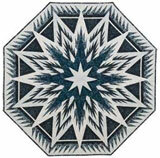 Think of applique quilts. The heavier background stitching smushes down the batting so that the applique design comes forward visually. For instance, the trees, the sky and the water could take more quilting than the 'subject' of the panel, i.e. the ducks and deer. If the sun is very light in color, you might want to give it a little quilting—less than the sky, but more than the animals. In addition, if this quilt is to be used on a bed, you'll want more quilting so that it can stand up to the stress of use and washings. I hope this helps. Again, trust your eyes and your instinct. And don't make any judgements until you've had a good night's sleep.